Bayern won an outstanding game 2:1 against a strong Dortmund despite falling behind early. The game was dominated by tremendous pace and momentum due to the tactical interactions between the two teams. FC Bayern started with three central defenders again. Alaba and Benatia played alongside Boateng as halfbacks, and, as in the game against AS Roma, Bernat and Robben started in the wing-back positions. The double six was formed by Alonso and Lahm, but calling their set-up a “double six” would ring false. Bayern normally play in a 3-4-2-1/3-4-1-2 when they use three central defenders. Personally, I wouldn’t say they did so in this game; Götze often acted on the same level as Lahm, letting himself fall back wide and, especially after the initial phase, spent more time in the left half-space while Lahm oriented towards the right. This formation was more of a 3-1-4-2 or even a 3-5-2 with the odd forward run from Lahm and the more frequent advances of Götze. Alonso, however, held a special role in the midfield trio after the difficult opening phase (which was more of a 3-4-1-2/3-2-3-2). He played centrally in front of the defenders and repeatedly dropped back. 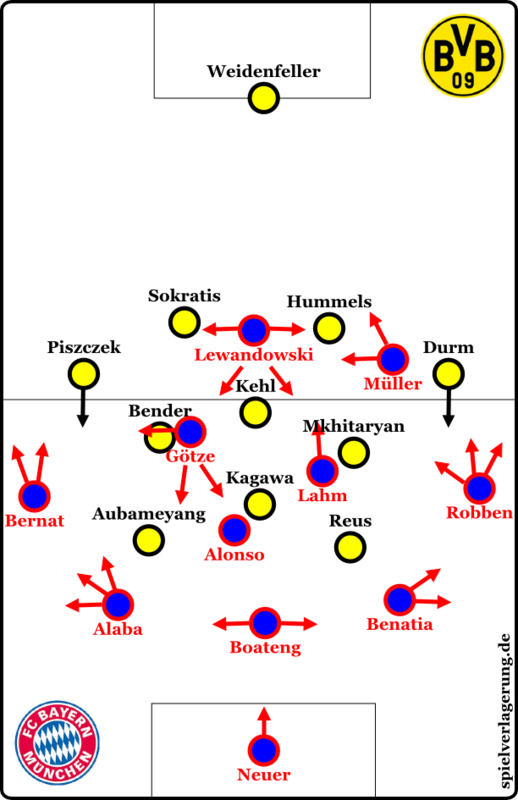 In some phases, Munich stood in a horizontal line of four during their build-up in order to create an overload against Dortmund’s pressing and allow them to move the ball more stably. This came at the expense of midfield presence, despite Lahm and Götze, but produced some interesting consequences. Alonso was drawn out of the narrow midfield spaces, where he had dangerous turnovers and issues running free, to an area where he could incorporate his potential strengths well, e.g. spaciousness in the passing game, aggressive pressing runs on turnovers, his general physical presence and his dynamic passing. Alonso, who preferred to drop between Boateng and Alaba, was also an additional passing option and provided relief from Dortmund’s pressing by generating a 4 to 3 overload. Thus, BVB did not want to be drawn out, blocked the middle, and didn’t push all the way up to the ball. Furthermore, there were a few interesting effects: Alonso’s falling back allowed the half backs to position themselves even wider, if necessary, to make it difficult for BVB to have access. In addition, Alaba and Benatia could play simpler passes along the wings to Bernat and Robben, which in turn allowed Götze and Lahm to support the two strikers. Yet, this wasn’t effective for a long time. BVB was able to prevent the worst for a long time. A quick glance at the starting lineup and one would have assumed that Dortmund were playing a 4-2-3-1/4-4-1-1 against the ball. Mkhitaryan and Reus weren’t on the wings as Reus played up front with Aubameyang. Kagawa played as the ten behind them, but in defense it almost immediately became a 4-3-3- or 4-3-3-0, because Kagawa moved forward and was positioned in line with the two strikers. The reason for this was the man orientations in midfield that were used as a means to get pressure and access. If Alonso was higher, Kagawa moved often into his original spot in the ten space, to cover or track him. His movement caused major problems to Alonso, whose dropping back benefitted not only the collective but the Spaniard. In addition to Kagawa, the central midfielders behind him were based loosely on their opponents. Mkhitaryan marked Lahm, Bender situationally focused on Götze, and they were covered by Kehl. Additionally, BVB’s focus on blocking the middle forced Bayern to the wings, where Dortmund was able to isolate them well. This caused the back four to break up in order to support the midfield, especially when Piszczek made aggressive forward pressing runs. There were 3-4-3 and even 3-3-4-ish shapes, in which Piszczek could get direct access to Bernat, take care of backpasses from Bayern and also challenge for the ball. However, Munich had relatively few direct turnovers despite the intense pressure. They could convert or often escape the pressure with their three defenders, individual dribbling, or playing difficult attacks to the end. Most turnovers came as a result of long balls from their being no open passing options. Because of their pressing formation and Bayern’s overload in their back line, BVB won most of the second balls and the battle in midfield (in the first half Dortmund won over 63% of challenges). In the end, both teams allowed many opportunities despite good defensive work; especially BVB. But for a long time there was a lack of goals, which was tactically justified. Due to the high pressure, the extreme presence of both teams in the battle for the ball in the midfield and the well-chosen defensive mechanisms on both sides, there was a tremendous amount of movement in the game. If the ball came into the middle third of the field, especially passes into the center, there was neither time nor space. Attacks were then taken very quickly, often in tight situations or the ball was played back. As for Dortmund, this led to integration problems for the offensive players. Kagawa was hardly given any time to find positions in between the lines for combinations. Aubameyang and Reus could hardly be played to and Reus was needed for his outstanding abilities in tight situations yet with his dynamically moving teammates he didn’t provide much. Otherwise he would probably have created larger holes and advantages but there were hardly any. Only Mkhitaryan was able to showcase his outstanding abilities with his priority in the offensive transitions or generally creating Dynamik in tight situations. Bayern’s integration worked largely because their positioning and roles were good despite the circumstances. However, they were hasty and forced shots because Dortmund’s pressure prevented them from reaching their potential and made them search for suitable shapes. They often had to attempt combinations when isolated on a wing or in an attack channel where they had to play difficult passes with inferior numbers. This ultimately contributed to the end of their attacks. Nevertheless, Munich were clearly dangerous and were able to play out some good, compelling chances in the first half. After half-time, they increased the tempo again. Bayern’s style of play did not change on paper, but in practice some adjustments could be observed. The movements of Benatia and also Alaba, where they now more clearly moved forward to join in the attack, were particularly striking; they were both anticipating on defense and moved up to play as hunters or functioned in the attack as full-backs. The midfield was also changed. Götze played higher, as Alonso primarily supported Alaba’s advances by falling back, and he often remained higher with Lahm. Both players at times pushed up vertically to occupy the spaces behind the strikers. The success of the stability, however, in these very risky movements was quite surprising. It is quite possible that it was the flexible movements, the swapping of positions, the indenting runs of Robben, and also the good, quick layoffs which ensured this. On the other hand, the decrease in intensity and physicality of Dortmund should be pointed out. They could no longer maintain the pace from earlier in the game, the offensive compactness and hence access was lower, and so was the presence in their ball-oriented movement. Thus, with Dortmund no longer as good in their pressing, Bayern found played the spaces better and pushed BVB backwards. Bayern’s counterpressing in this stage also worked very well, which also made for better balance and stability. Normally, it is impossible to control Dortmund’s counterattack if they are in the lead but the German Rekordmeister succeeded. Presumably, that is why Jürgen Klopp made some changes. With the 4-4-2, BVB probably wanted to improve the wing defense and have a better wide shape. The movements in the midfield should be facilitated for that because they had to move less in the midfield and wanted to have the extra player in this line as well to enable the strikers to save some energy by being a bit more passive. This change sounds pretty obvious; it has a 4-4 shape rather than a 4-3 in the first two lines, the team should be more compact, and with two central players continue to have presence in the opposition’s six space and in their own counterplay. But the 4-4-2 brought many problems, which are somewhat abstract in nature. These range from channel effects to the consequences to the balance of the Bayern in the circulation game; but what was clear were the consequences of a reduced first line. The duo of Aubameyang and Reus were never effectively able to exert pressure, Bavaria’s halfbacks had significantly more time and space, the sixes were freed as a result and Bayern took over the midfield. The factor of more buildup time in their first line meant it was also easier for them to push up and improved their movements in the positional play. As a result, Bayern were more flexible; Lahm could move up, Bernat even ran up a couple of times, and Robben was unstoppable. The game tipped completely however after Ribéry’s substitution. Ribéry came on for Götze in the 70th minute, then Kagawa was immediately replaced by Großkreutz and the transition to 4-4-2 was complete. At this point, then played Thomas Müller as a right wing-back, Ribéry went repeatedly attacked Subotic on the left and Robben occupied Durm and Sokratis; a very unpleasant distribution for Borussia. To make matters worse, Ribéry was still fresh and effortlessly prevailed several times with his sprints. Directly after the tying goal (72nd minute) by Lewandowski, Bayern reorganized. Claudio Pizarro aka Bizarro came on for Müller in the 81st minute. Munich seemed to pull Robben back again, but it looked more as if it were a 4-2-1-3/4-2-4 with Benatia now as a full-back, although Robben probably just gambled and BVB had no real moments of buildup. The 2:1 was only a matter of time, but came down to a penalty kick. The substitution of Ramos for Aubameyang had no consequence, Rode for Lewandowski in the closing stages ultimately meant a clear transition to a 4-3-3 with Alonso, Lame, and Rode in midfield. This spelled the end of the game as there wasn’t another chance. A very strong Bayern prevailed in an interesting game against a strong Dortmund. Surprisingly, they turned the game, but showed a tremendous intensity in the work in and out of possession in the second half. We saw the usual flurry of adjustments from Pep, while Klopp’s big change – which was partly forced because of the personnel and understandable due to the lead – failed. In the end, it was some bad luck for BVB, but an absolutely deserved victory for FC Bayern in a great game. Thanks to @rafamufc for the translation!